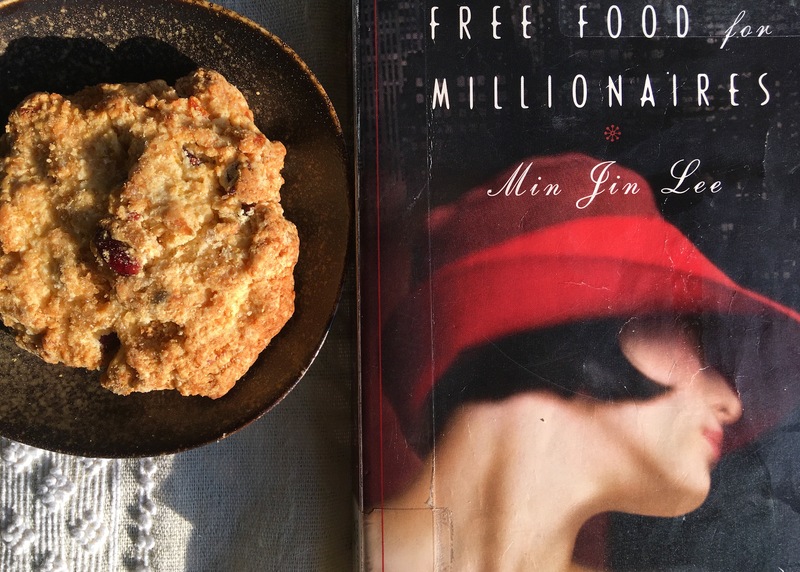 Casey Han, the main character of Free Food for Millionaires is not much of a cook, but her friend Ella Shim loves to cook, read cookbooks and to eat pastries and ice cream when things are not easy. When life troubles Ella, she eats baked goods (homemade or store bought), and in her freezer, there are always stocked items to warm for her guests. Ella, whose mother died when she was an infant, has learned to cook and to nourish herself and others literally with food. She is a privileged ingenue who learns a great deal about life through a tough marriage and divorce. I like Ella very much. She is a classic good girl, and through all of life’s unfairness, she fights to be an ethical person. I think that is not easy to do. On the day Casey learns that her ex-fiance is going to marry another woman, Ella has fortuitously baked her scones. (Book II, Chapter 12, p. 309). As for me, when life gets tricky, I turn to the kitchen. I subscribe to Saveur, Bon Appetit, Cook’s Illustrated, and Gourmet. I tear out tempting pages and file them into clear folders, and I would hazard a guess that I make about 1 out of 40 to 50 recipes. The problem is that once I like a recipe, I make it again and again—tricking out the revisions with new ingredients. Unlike writing fiction that for me takes a very long time, I love the process of starting and finishing a project within an afternoon. Also, everyone is delighted to get a bowl of chicken and rice soup or a slice of chocolate cake. In my small kitchen, everyone is happy. Hey, me, too. This recipe is adapted from The Vegetarian Epicure by Anna Thomas. It was a cookbook given to me by my college roommate Germaine Netzband twenty years ago on my 19th birthday. I don’t think I have seen her in as much time, but I still think of her fondly whenever I use this book. This is neither a sweet scone recipe nor a savory one. However, I have baked these traditional scones for English friends who have approved heartily. They usually prefer currants, and I like the dried cherries or dried apricots, too. If you can find some clotted cream, do treat yourself. I am admittedly an occasional glutton for such luxuries.So, now, I am going to imagine you and your friends tucking into piles of hearty curried chicken sandwiches cut into triangles, warm scones slathered with clotted cream and spoonfuls of jam, and of course, wedges of iced cake to finish. There isn’t much in the world preferable to a nourishing tea with friends and books. I hope your large plate is brimming, well balanced on your knee, and your napkin handy. I am raising my tea mug to you, and I say cheers. Have a second helping of clotted cream for me. 1. Preheat oven to 400 degrees. Grease a large cookie sheet. In a large mixing bowl, beat the buttermilk, egg, and sugar. Sift 3 cups of flour together with the baking powder, baking soda, and salt. Add about 2/3 of the flour mixture to the buttermilk and stir well. Gradually add the melted butter, incorporating it thoroughly into the mixture. Stir in the remaining flour mixture and the dried cherries. A little more flour may be necessary to form stiff dough. 2. Turn the dough out on a lightly floured board and knead for several minutes. Separate dough into 3 equal parts. Shape each part into a circle, approximately 1 inch thick and 4 to 5 inches across. Cut the circles into quarters with a sharp knife, and arrange dough wedges on the cookie sheet. 3. Bake for 20 to 25 minutes or until lightly browned on top. Please watch this carefully. Sometimes, I pull them out after 18-19 minutes depending on the oven.